Being the degree of the highest honors of the Republic of Azerbaijan the title National Hero of Azerbaijan was defined by Law No. 331-XII dated March 25, 1992 “ On the determination of the title of National Hero of Azerbaijan. 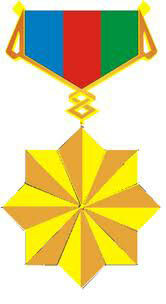 Title National Hero of Azerbaijan” is given for exceptional service and courage for the sake of independence and prosperity of people of the Republic of Azerbaijan. Title National Hero of Azerbaijan is given by the President of the Republic of Azerbaijan on its own initiative or on recommendations. Title National Hero of Azerbaijan is given once to same person. The special mark of distinction National hero of Azerbaijan - Moon-Star medal was set by the Law No 201 dated Jul 7, 1992 “On Setting of special distinction mark of the National hero of the Republic of Azerbaijan. Moon - Star medal was replaced with “Gold Star medal by Law of the Republic of Azerbaijan “ On amendments to some legislative acts of the Republic of Azerbaijan dated February 6, 1998, Law No IGD 429.